Hi, I’ve been working full time getting Have Home Will Travel, The Ultimate International Home Exchange Guide for Families published; and it will be very soon! It should be available for purchase as early as April 30th and no later than May 15th. It is that project that has kept me from blogging as much as I would like. I feel as though I’ve neglected my responsibility to you, being that you are all kind enough to follow me, so I’d like to make it up to you by sharing a funny little travel story. The picture speaks volumes for this story. My family traveled to Italy for a two week vacation in 1998; this was before I learned about the wonderful world of Home Exchange. The second week was spent in a villa rental on the beautiful island of Capri off the Amalfi Coast. That part of the trip was like living an episode of Lifestyles of the Rich and Famous. It was amazing! But, it is the first week that prompted this funny story. We spent the first week with my husband’s family (first cousins) in their working class neighborhood, Sarno, outside of Naples; the same town where my husband was born. My husband immigrated with his family to the USA at the age of two, and is as Americanized (aka spoiled) as the rest of us. Looking back we have very fond memories of the time we spent with his cousins and it truly was a wonderful cultural experience. It was also wonderful to introduce our kids to where their father was born. However, some aspects of the trip, still cause us to laugh 15 years later! When we arrived in Italy, hot and exhausted from our long journey (we flew from NYC to Brussels where we had a six hour layover before flying to Naples), we found our relative’s home, not surprisingly, without air conditioning. We were surprised to find my husband’s cousin Maria in her tiny kitchen preparing a mid-day feast for us, including cooking steaks on an indoor grill. It must have been 100 degrees (farenheight) in her house. We managed to smile through the hot meal in the hotter house, and then smiled again when they escorted us to our perfectly nice bedrooms on the 3rd and hottest floor of the house. To our dismay, there wasn’t a fan in sight. I decided to take a nice cold shower (great idea); except for the fact that there was barely enough water pressure to brush my teeth. As I lay in bed that first night, I turned to my husband and said ‘this is going to be the trip from Hell.’ A little guilt perhaps, but I was hot, tired and cranky, and it was HIS family after all. 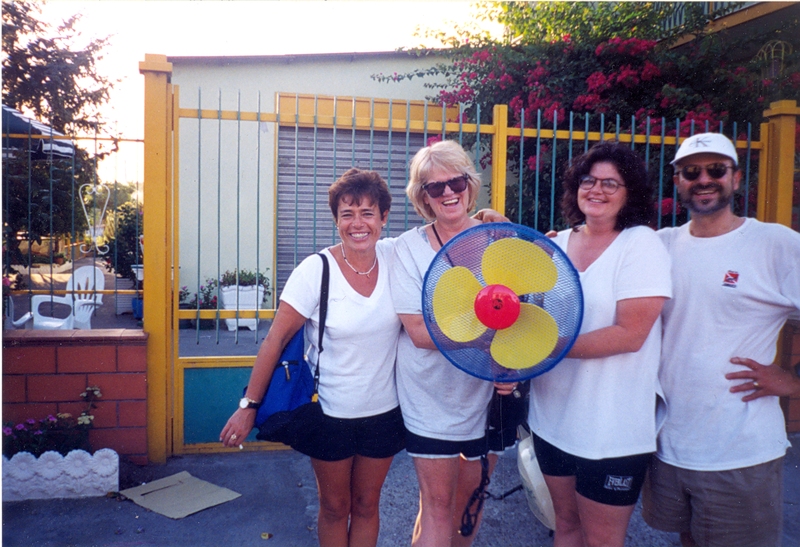 We spent a good part of our first day trying to find a place to buy a fan; apparently, fans were not a popular appliance in Sarno. We ultimately found our fan, a very colorful one at that, and this made us all very happy (giddy in fact). We actually bought three of them! At the end of the week, we insisted our relatives take the money we offered them as repayment for the expense of running our fans! We may be spoiled Americans, but we are not rude Americans! This entry was posted in Uncategorized and tagged capri, home exchange, Italy, naples. Bookmark the permalink.